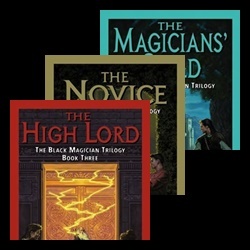 The Black Magician Trilogy is a bestselling young adult fantasy series by Australian author, Trudi Canavan. 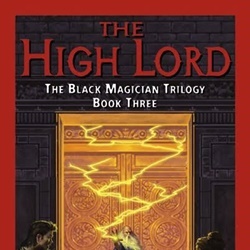 This trilogy is about a young girl, Sonea, who inadvertently makes her untapped power known when she effortlessly penetrates a magical barrier forged by the Magicians to shield themselves while doing the annual purge of the city. After penetrating the barrier, Sonea ends up deciding to leave the city to train with the Magicians Guild to learn how to control her power. 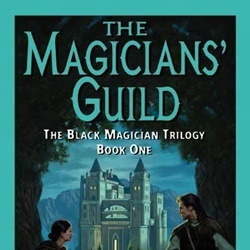 The Black Magician novels chronicle her time training with the Magicians Guild and all the hardships she faces from not only her peers, but some of the magicians that train them. Armed with a rock and yet unknown magical power, Sonea manages to break through the magical barrier surrounding the Magicians' and injures one of them. Fearing a possible rogue magician, the Guild begins searching for the young, untrained mage that so effortlessly penetrated their shield. The longer she remains untrained, the more dangerous she'll become to herself and everyone around her. Eventually she's forced to make a decision: Can she push aside her reservations and join the ranks of the Magicians' Guild? Or will she return to the slums with a magical block on her power? Quick read, simple story line, but good nonetheless. Recommended to young adult readers and lovers of fantasy novels. Even if a magician's powers surface of their own accord, he will soon be dead if he does not gain the knowledge of how to control them. Alone among all the novices in the Magicians' Guild, only Sonea comes from lowly beginnings. Yet she has won powerful allies-including Lord Dannyl, newly promoted to Guild Ambassador. But Dannyl must now depart for the Elyne court, leaving Sonea at the mercy of the lies and malicious rumors her enemies are busy spreading... until the High Lord Akkarin steps in. 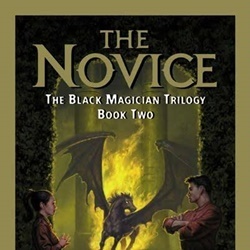 The prince of Akkarin's support is dear, however, because Sonea, in turn, must protect his mysteries-and a secret that could lead a young novice mage deep into the darkness. Meanwhile, Dannyl's first order to resume High Lord Akkarin's long-abandoned research into ancient magical knowledge is setting him on an extraordinary journey fraught with unanticipated peril-as he moves ever closer to a future with both wondrous... and terrible. Sonea has learned much since she was but a penniless urchin possessing an awesome untapped ability. She has earned the grudging respect of her fellow novices and a place in the Magician's Guild. But there is much she wishes she had never learned-what she witnessed, for example, in the underground chamber of the mysterious High Lord Akkarin. And the knowledge that the Guild is being observed closely by an ancient fearsome enemy. Still, she dares not ignore the terrifying truths the High Lord would share with her, even though she fears it may be base trickery, a scheme to use her astonishing powers to accomplish his dark aims. For Sonea knows her future is in his hands-and that only in the shadows will she achieve true greatness... if she survives.